The fictional writings of ancient Greek philosopher Plato proved so believable that people still speculate about the location of the lost city of Atlantis to this very day. It’s said that the gods of Greek mythology were responsible for condemning Atlantis to the bottom of the Atlantic Ocean and, while the location may not actually exist, you can immerse yourself in the great myth by playing the Secrets of Atlantis video slot as you make a splash and swim to the bottom of the sea to discover what lurks in the sunken city. With valuable treasures worth up to 320,000 coins to discover, I have a feeling you won’t be resurfacing anytime soon – cue some very wrinkly skin! Powered with software by Net Entertainment (NetEnt) and available on tablet, iPhone and Android devices too, your underwater adventure begins with an intro of you going from land to the depths of the sea where you’ll find yourself surrounded by beautiful mermaids, clams, sea creatures and many other valuable treasures as a bright light beams down from the surface and a magical soundtrack accompanies your exploration. Boasting a very impressive payout percentage of 97.07%, this Greek mythology themed slot contains 5 reels with 4 rows and 40 fixed win lines. For the honour of exploring such magical waters you will have to pay a fee of 20p up to £200 each time and it’s also worth noting that it’s a win both ways slot so it doesn’t matter if your winning combinations are on the latter reels. As you explore the ruinous city you will be hoping to experience the Nudge Wild feature which comes into effect if the mermaid only appears on the reels partially and the Highlight feature which randomly highlights positions on the second, third and fourth reels on every spin which can subsequently activate a special Colossal symbols Re-Spin – a feature that promises to see you resurface with epic wins! 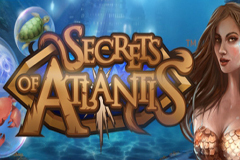 The graphics team at NetEnt rarely disappoint and this free Secrets of Atlantis slot is yet another visually stunning release which includes 3D graphics that make you feel like you’re at the bottom of the sea. While a mermaid is the most beautiful creature lurking at the bottom of this sea, you will also see clams with a shiny pearl inside that are worth the top prize at up to 400 coins, there are rubies, emeralds and sapphires that have been designed in the style of sea creatures which are worth up to 70, 60 and 50 coins respectively, plus you’ll see crabs, turtles and jellyfish inside bubbles and these offer the lowest payouts of all at a mere maximum of 15 coins. The mermaid that swims around at the bottom of the sea will leave you mesmerised by her beauty and you could find yourself giving her a gentle nudge to come into full view whenever she is shy and only partially appears. If she only appears on active win lines partially, she will be nudged up or down so that she covers the whole reel as a Stacked Wild symbol – a very stunning sight which so often results in equally stunning wins. During each and every spin you will notice that positions on the second, third and fourth reels are randomly highlighted by a bright light and if you manage to see that light across all three of the reels you will activate the Colossal symbol Re-Spin feature where things get very exciting. This will see a 3x4 block of symbols get transformed into one Colossal symbol before a re-spin occurs. You’ll be crossing your fingers for big wins here and if the central three reels are lit up again during this spin you will get yet another re-spin, plus if the Nudge Wild appears partially during a re-spin it will be nudged up or down to cover the three central reels instead! That’s how so many people have described Plato’s story and the great myth has made for an equally great slot! We’ve played numerous real money online slots with a Greek mythology theme and, while it’s quite disappointing that there is no free spins feature, Secrets of Atlantis by NetEnt is without doubt one of the most visually stunning online casino games that we have reviewed with the inclusion of Nudge Wilds and Colossal symbol Re-Spins ensuring that your underwater exploration sees you resurface with plenty of treasure!